Contact me and we can go through your requirements in detail. If necessary a visit can be arranged to see my work first hand or for me to meet/study the subject. Most commissions are handled by phone, email and post with updates and photo references etc provided by the client. Preliminary artwork is done before committing to a design and price, so there is no obligation until we have agreed on what is required. You are the best judge of the work, so I will keep you informed at all times to make sure you are happy. 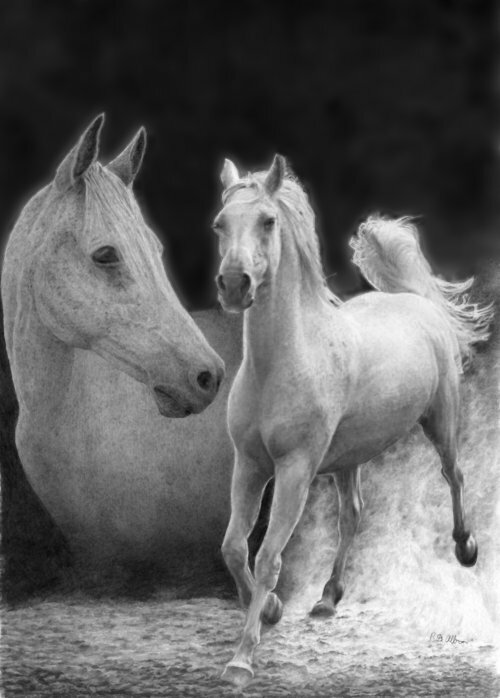 Prices start at £150 for a A4 pencil drawing and £500 for the same size painting. My clients come from around the globe so distance is no obstacle with the way I work. A good first step is to email me your thoughts on what you have in mind with some photographs if possible. 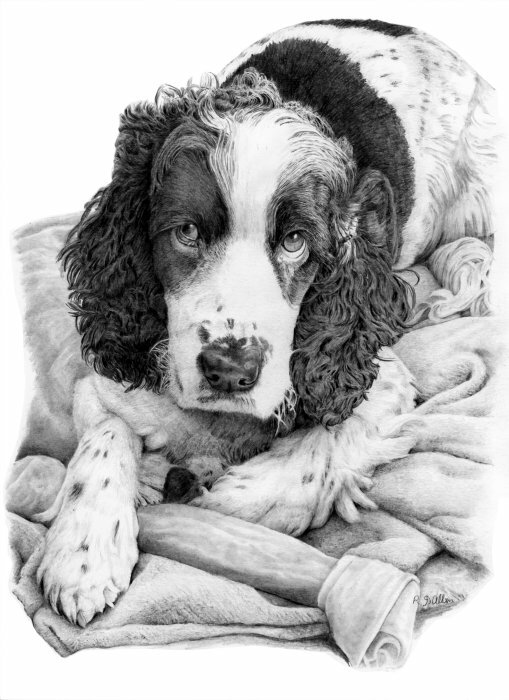 An A4 pencil drawing of Lenny. 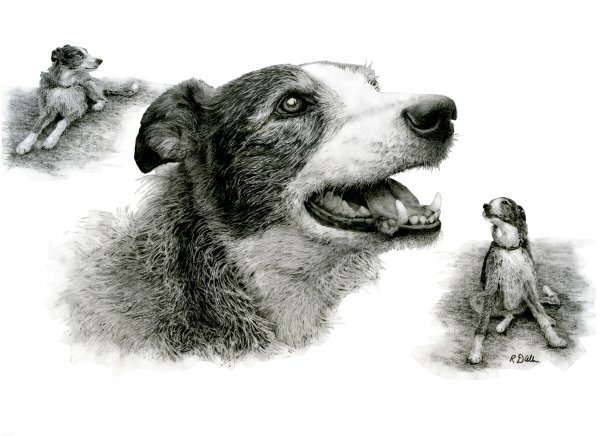 The use of a central head study and additional thumbnail drawings outline aspects of Lenny’s character. Like every artwork undertaken, every effort is made to achieve a excellent likeness and provide a visual impact that creates a three dimensional representation of the subject on a two dimensional surface. This is a skill only possible by an artist using observations of the subject, photographs and feedback from the client on the character. The owners were overwhelmed with the result. 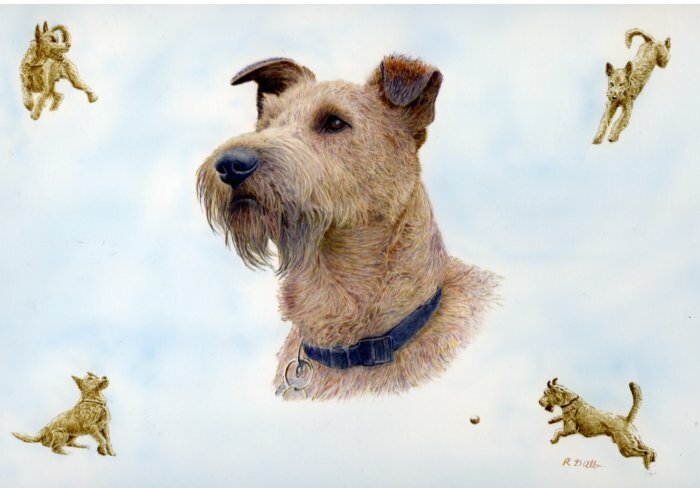 An A4 watercolour of Paddy the Irish Terrier. 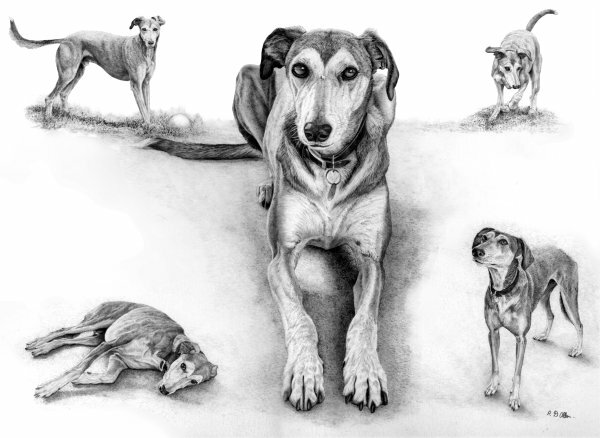 This design is a very popular format for commissions, revealing elements of the animal’s character. Irish terriers are very animated in their movement. 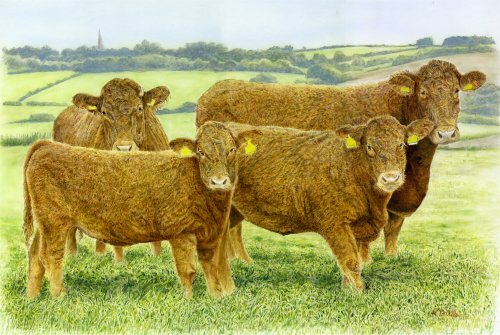 An A3 watercolour commission from the award winning owner of the best South Devon herd. As well as the subjects, it was important to include the correct setting, so features like the local church can be seen in the background. 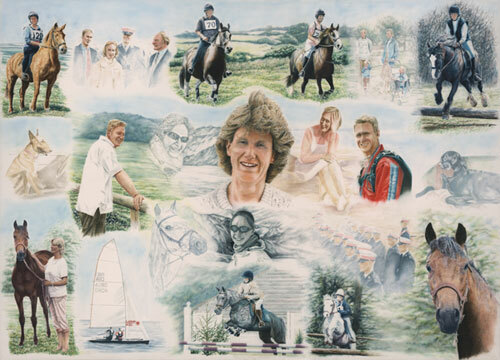 This water colour painting 48x36 inches describes the Archer family and their interests. A legend describing the content goes with the painting and prints for each family member. The work provides a highly personalised and unique record Something which can be passed down through future generations. Further examples of my work can be found in the Gallery section. These include originals created to demonstrate capability as well as work and limited edition prints for sale. 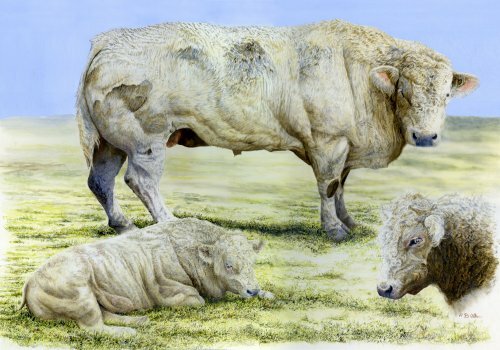 After doing many commissions of dogs and horses, I recently started to work on livestock subjects. 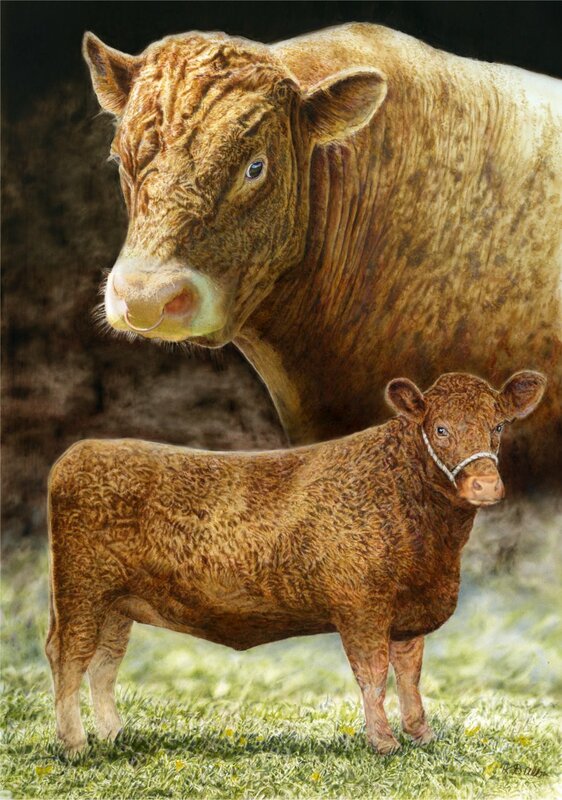 This painting was done for a Cornish farmer of his prize South Devon Bull and Heifer. 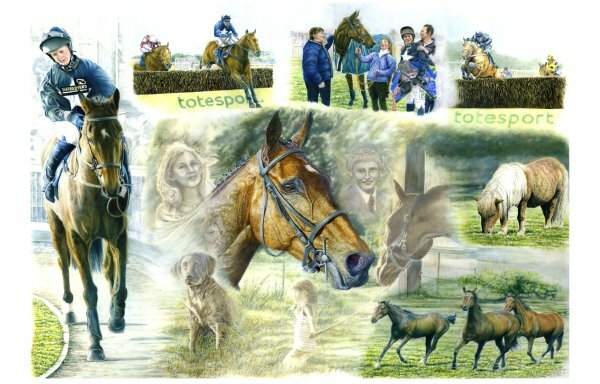 The owner of this commission wanted something special to remember their race horse by. 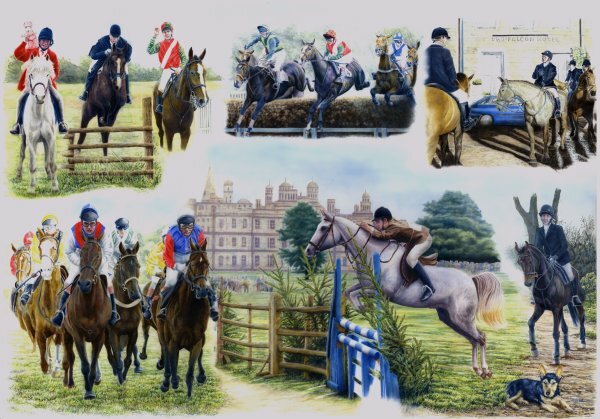 The story in the painting is of 3 wins involving support and involvement from family and friends. 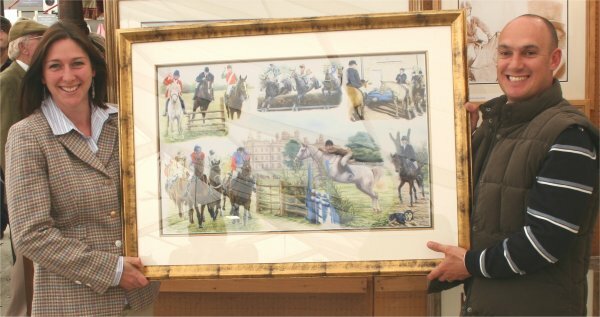 When receiving the painting the client said “Wrags to Riches was my first racehorse and will always hold a special place in my memory. I was so lucky with three winsand many places. Ridden by my son Chris Honourand often watched by my racing-mad grandson here is our personal story. 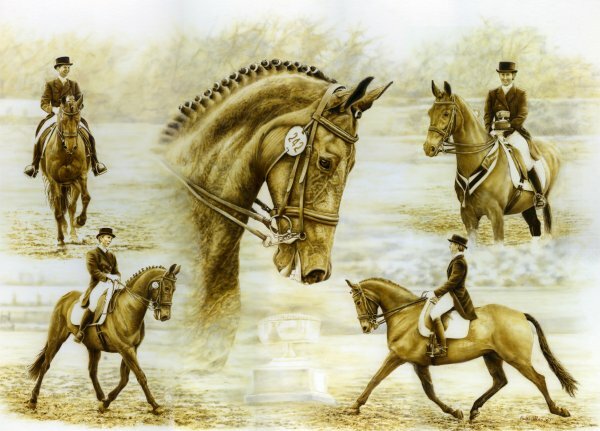 A top Dressage competitor wanted something special for her 40th birthday and retiring horse. Instead of a full colour painting this work was given a “timeless quality” by painting in watercolour sepia. When presented with the work on her birthday, tears were shed.